Soldier Field is a prominent landmark in down town Chicago. 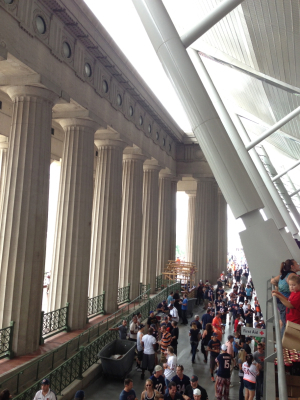 It is on the area known as the museum campus, next to the Field Museum, the aquarium and planetarium. So ever since my first visit to Chicago last year I have been eager go watch the Bears play a game there. The stadium was build 1922 and is named Soldier Field as memorial to soldiers who have died in wars. Soldier Field is the oldest stadium in NFL and the second smallest with a capacity of only 61 500 – about the same as Ellis Park. It was amazing to think that even with a capacity crowd it was only about half of what I was apart of the day before at ‘The Big House’. It was remodeled extensively in the early 2000. From the outside is look a little like a spaceship landed in side some Roman or Greek ruins. How it got to be like that is a funny story, here is how some of the tour guides tell it. When they wanted to build a new stadium they could not get approval to knock the old one down since it was a national monument or something like that. So they build the new stadium inside the old one. But once it was completed the monument status was revoked. Which meant they could now actually build anything they want, but it was to late of course. 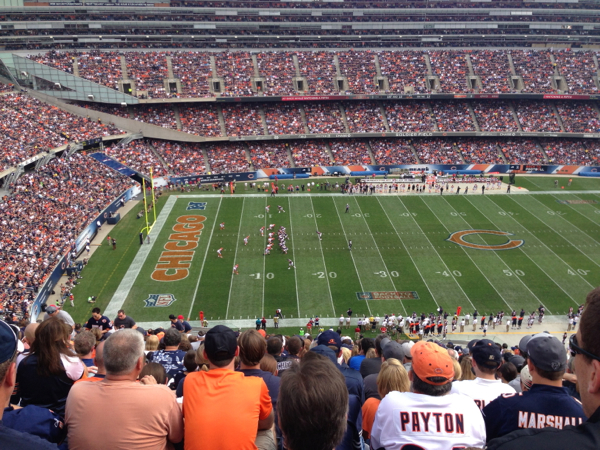 I had a great view of the action from my seat at Soldier Field. NFL is predated by collage football by several decades, and is a big commercial machine, with advertising and sponsorships everywhere, a stark contrast to college football. There were pre-game fireworks and a half time show by a local college marching band. Over all it was a great experience at Soldier Field. The Bears clearly have a very passionate following in Chicago; you see Bears flags everywhere. The game might be completely different then rugby but people here are every bit as passionate about their team as we are about the Bulls back home. This entry was posted in American Football, Chicago, Sports, Things to do in Chicago on 2013/09/17 by Justinus. Last weekend I had the chance to attend my first collage football game. It was one of the most amazing sporting experiences I have ever had. Another Starter League student suggested I go watch a game at The Big House. Four fighter Jets did flyovers before the game! 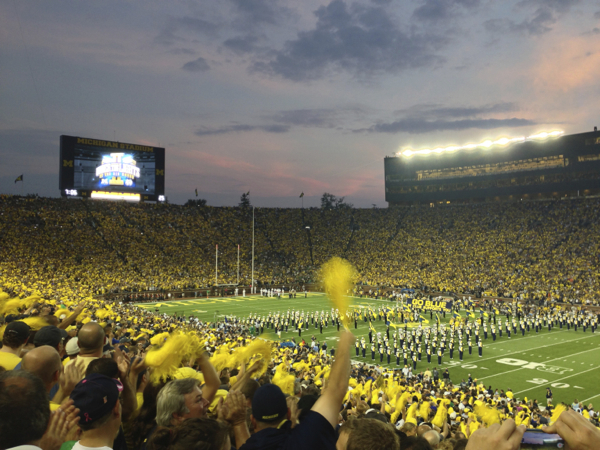 The Big House is the nickname for Michigan Stadium in Ann Arbor, Michigan. Home to the football team of the University of Michigan. It is the biggest sport stadium in the US, with an official capacity of 109 901. At Saturdays game a few new records were set, highest ever attendance – 115 109 and most consecutive games with more than 100 000 attendance – 245. The original stadium was build back in 1927 with a capacity of 82 000. Even today after much remodeling the seats are still just benches with no arm or back rests, which allows them to get more people in. Not that it matters much, as I must have only sat down for less than 10% of the time on Saturday. Panorama view from my seat at The Big House! The energy in the stadium was electric, at a level equal to a Springboks vs. All Blacks or Lions test match, which is insane if you consider that this was only a collage football game. The Wolverines, name of the football team, played their first game back in 1879. It was also very apparent how ‘commercial’ free the day was compared to other sports. There was no advertising on the field or inside the stadium and no ads were played on the two giant scoreboards. It was actually very refreshing! The Crowd eagerly awaiting the teams arrival on the field. 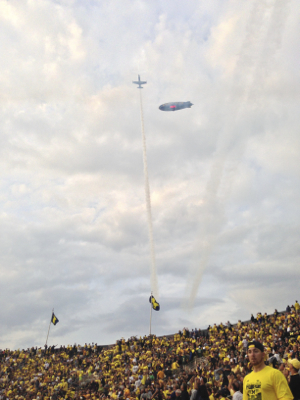 Before the game there were four fighter jets doing multiple flyovers, and there was a big blimp floating around. Walking up to the stadium it looked like most people had been spending the day with something on the braai and a beer in hand waiting for the game to begin. This entry was posted in American Football, Sports on 2013/09/13 by Justinus. I love reading, and mostly read business related books. I have also read my fair share of leadership books over the past 10 years. A month or so ago a friend that I studied with recommended Multipliers. His book recommendation has always been good in the past and he was quit excited about Multipliers. So immediately got a copy on my Kindle. He turned out to be spot on. Multipliers is the best leadership book I have ever come across. I found it so valuable that I read it a second time right after I’ve finished it the first time. Multipliers describe a continuum of leadership with the two extremes being Multipliers and Diminishers. The research Multipliers is based on, showed that Multipliers on average, got more than two times more out of their people than Diminishers. Throughout the book they contrast the behaviour of Multipliers with Diminishers. Multipliers are Talent Magnets while Diminishers are Empire Builders, Multipliers are Challengers while Diminishers are Know-it-Alls, you get the idea. One of the most fascinating observations was that many people that worked for Multipliers reported that their boss managed to get more out of them than they thought they was capable of. While many former Rock Stars revert the ‘quit and stay’ approach when working for a Diminisher. Multipliers managed to reframe the whole way I look at leadership. I just look at the world through completely different lenses now. Where previously, I would get frustrated with some situations I now immediate ask my self how a Multiplier would look at it. I try to figure out how I can learn from it and change my behaviour. 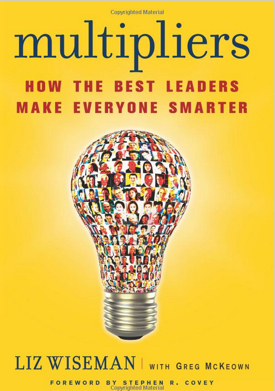 Multipliers work from the assumption: “People are smart, they will figure it out”, while Diminishers assume: “really intelligent people are rare, I am one of them”. This leads to two complete diverging ways of operating and behaviours. You have to read Multipliers, it will change the way you see the world! This entry was posted in Book Reviews, General, Reviews on 2013/09/06 by Justinus. The Modal for one message on the iLostandFound profile page. We have tried to work with mobile and tablets in mind and the results look pretty cool. 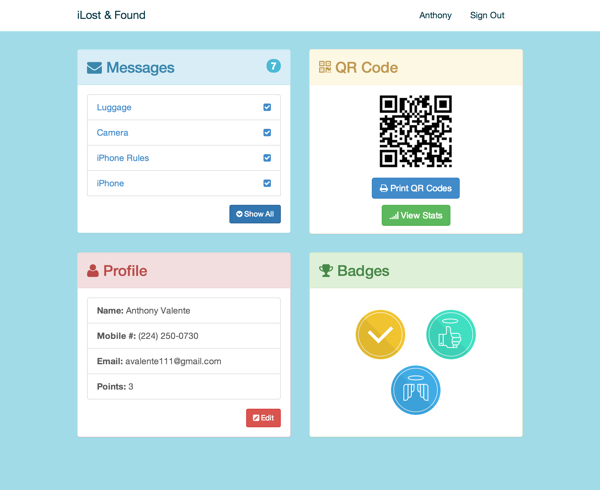 We broke the profile page in to four parts; messages, QR code, profile and badges. Font Awesome provided the perfect icons for each of these. Then we’ve used a modal to show detail of the messages and to edit your profile. A modal is when something shows over the page with black transparent background. View of the profile page on a mobile device… Looks awesome! This entry was posted in Coding, Starter League on 2013/09/02 by Justinus.